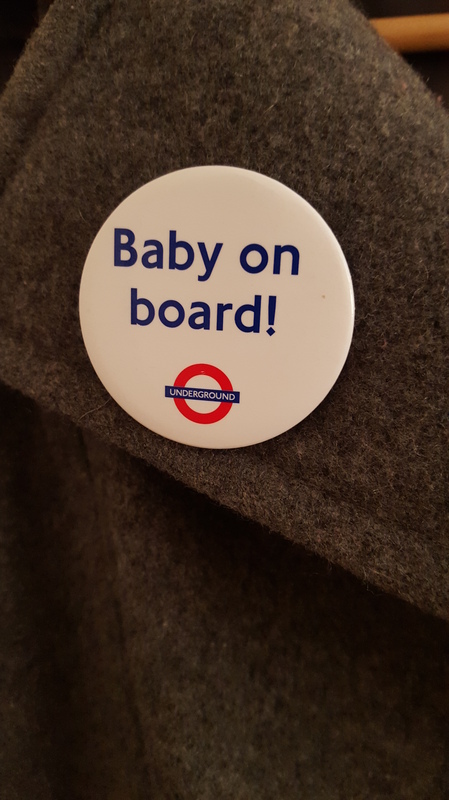 Baby On Board – Commuting with a bump! As a worker in London who commutes from Essex every day, I get to suffer the daily chore of fighting for a seat, train delays and other (sometimes smelly!) commuters. On the whole, I don’t have a bad journey – I get on at the beginning of the line so always have a seat, I don’t have to get the tube, and my fellow commuters are mostly nice people! So I wasn’t too worried about travelling whilst pregnant. However, I did get myself a baby on board badge. I liked to wear this before I was showing, and when I was travelling in the winter and had a big coat on that hid my bump. I know some people think that this is attention seeking, and pregnant women shouldn’t have any special treatment, and I agree on principle. Just because I’m pregnant, I don’t expect special treatment, however, it is hard work being pregnant. When you’re suffering from morning (or all-day) sickness, the last thing you want to do is stand up for an hour. What you actually want to do is sit in the corner somewhere hugging your seat and muching on breadsticks, trying not to be sick on the passenger sitting next to you (or was that just me?!) Likewise, when you’ve been at work all day, you really really need that seat at the end of the day to get home in some relative comfort. As I said before, I was pretty lucky on my journey and pretty much always managed to get a seat, unless there were delays. I’m not confrontational, so I wouldn’t ask someone to give up a seat if there were none free – however, I might have ended up on your lap from fainting if you didn’t! So I liked to have the badge, as people tended to spot it and then offer a seat if I didn’t have one. They also would let me on the train first, so I could find a seat easily. I also hoped it would stop people from pushing, as often happens during train delays when there are limited seats! I only wore the badge when I had my coat on, or before the bump was obvious – then I hoped people could tell I was pregnant and just be nice!! One thing that Abellio Greater Anglia do to help pregnant women who have a season ticket, is offer a seat in First Class when they are travelling in the last 8 weeks of their pregnancy if they aren’t able to find a seat in “cattle class”. You just have to apply for a ticket (details on their website). I didn’t actually take up this offer, as I said before I always managed to get a seat (and never got round to applying for it!). But it’s a great idea for those travelling on busier trains. Overall I didn’t have much to complain about on my commute. However I will say, if you ever see a pregnant lady, please please let her sit down – she’s not being lazy or thinking she’s someone who deserves special treatment, she is doing her best to grow a human being and a little consideration is always appreciated.